I have definitely made progress with food choices today: lots of fruits, vegetables, water (not spilled), and berry pie (thought I’d slip that in there) along with a bit of exercise. Otherwise, today looked a lot like yesterday with the exception of an “off-campus” meeting with President Marianne Hirsch. We sat outdoors at an Upper West Side café and worked for two hours on a long list of topics. First, though, we chatted about our recent travels (Istanbul for her) and adventures (sailing for me). The MLA membership elects a new second vice-president every year, and that person assumes the presidency and functions as board chair in the third year of his or her term in office. While that gives presidents plenty of lead time, it also means I work with a new chief elected officer every year. It falls to me to maintain continuity as we move from one president to the next, and I also need to be flexible in adapting to each one’s leadership style. Marianne is the twelfth president with whom I’ve worked and she resides in New York, as have three others since 2002. Being able to get together in person on a regular basis certainly facilitates matters. In general, it’s good for me to be in touch with the president at least once a week; we often send each other emails several times a day. Our discussions today centered on preparing the agenda for the October Executive Council meeting, reviewing the progress on several major projects, and advancing our strategic planning. A very productive two hours. Back at the office, I took a quick follow-up call from a reporter from the Chronicle of Higher Education who is writing on what scholarly associations and academic departments are doing to prepare PhDs for broad career paths. I then met with my director of administration and finance to go over annual performance reviews and merit increase recommendations. The next meeting of the day was with three colleagues with whom I am working on the MLA’s plan to develop a formal archive. As we reviewed proposals from consultants, my colleagues and I thought about the inefficiencies in current archiving practices, but we also marveled at all the material collected at 26 Broadway as well as what is available in digital form. Right now, anyone can search the minutes of council meetings, the content of convention programs, and basic data like membership statistics by accessing PMLA through JSTOR. We also house a collection of our journals and book publications from the nineteenth century on, as you can see from the photo of the bound Publications of the Modern Language Association of America that are stored in the executive director’s office. I try not to handle the most fragile volumes, which are, uh, falling apart. On the walls of the main corridor, you can view photographs from early association meetings and social events. 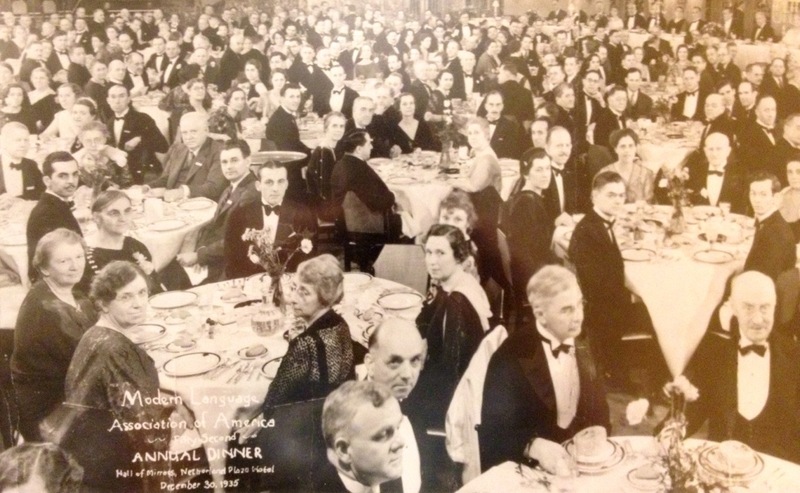 People often admire the picture of the 1935 annual dinner held at the convention in New York in the Netherland Plaza Hotel’s Hall of Mirrors. Who among the women held professorial rank, we on staff sometimes wonder? For a lighter take on the association, stop in front of U.C. Knoepflmacher’s graphic narratives that give a “Strobe-Light History of the MLA” and show scenes from annual conventions. Members who visit headquarters always remark on these beautifully executed and funny depictions of different moments in the evolution of our profession. I’ve studied them dozens of times yet always return for another “read,” as one would do with a good (graphic) novel! And then there’s that little bald-headed man with a paunch, done up in heavy plaster, who stands in my office, clutching his PMLA and sporting a Phi Beta Kappa Key. He stands atop a block that says “The Old Guard.” I believe Phyllis told me that the wife of an MLA executive director (or was it president, Phyllis?) made this statue for the office. It’s good to pay our respects to the Old Guard even as we modernize our 1883 institution. I remind myself that in 100 years, if any trace of me is left at the MLA, I’ll look as dated as the ladies at the dinner tables and as old guardy as Mr. PBK. So be it. It’s humbling and daunting to belong to such a long lineage. It’s now 10:30 P.M. and my day is drawing to a close. Tomorrow is “hunker down and write” day. I’ll let you know how it goes.